Art Modell died early this morning in Baltimore. This will elicit a wide range of emotions across the sports universe, but most particularly in the city that brought him his wealth and power, Cleveland, Ohio. There will likely never be a bigger villain in the city of Cleveland than Arthur Modell, despite how hard some will try. Unfortunately, some fans will react with unseemly satisfaction, or even glee, at the man's passing, from the anonymous screens of Twitter to--I'm sure--the beer fueled courage in the Muni Lot this Sunday. God knows there was no shortage of fans wishing for Modell's suffering and much, much worse indignities to be done to the man. 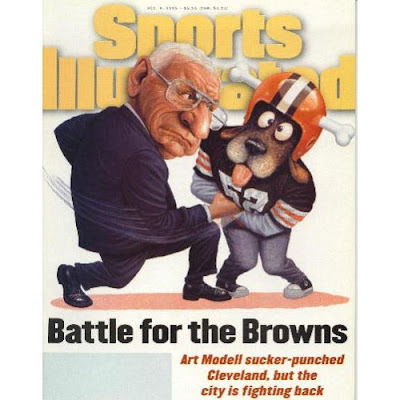 Sure, I disliked Art Modell and everything he stood for, for his greedy, selfish move in Cleveland. But in the spirit of fairness, I need to share something that I learned only a few months before the Browns announcement, that made it impossible to "hate" Mr. Modell. My mother suffered from breast cancer for many years in the early-to-mid-90s. Near the end of her illness, she was in the Hospice of the Western Reserve on it's beautiful campus on Lake Erie. On one of my many visits there during the summer of 1995, the nurse was showing off the beautiful chapel that was completed at the hospice house. Although there was no plaque or anything noting the face, the nurse said that it was all paid for by Art Modell, and he wanted no publicity or credit for it. And she said that's not the first thing he did for that hospice. In fact, he and his wife started it. So when I hear all the obituaries mentioning his philanthropic works, I know that's not just PR spin. The names "Lerner" and "Lewis" and "Wolstein" may appear on buildings throughout Cleveland, but "Modell" never did, even when he was in the city's good graces. Six weeks after my mother died, Art Modell announced he was moving the Browns. Being charitable doesn't erase Modell's negative deeds, and certainly won't erase the enmity from Cleveland. But for this Browns fan, the emotions are far more complex than that. I'll always hate the Ravens, and hate the devious actions that Mr. Arthur Modell did to the City of Cleveland. But this is a complex man. An accomplished man who contributed much to the behemoth which is the NFL. And in respect for what he did that was good, and for his family, I'll just say Rest in Peace.